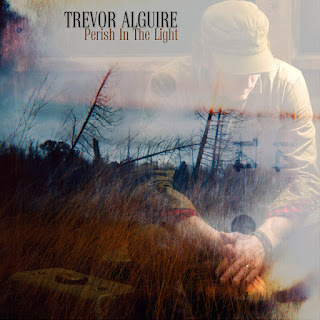 It has been a busy decade for Canadian artist Trevor Alguire from a recording perspective and it’s likely to get busier once the praise floods in for his brand new album PERISH IN THE LIGHT. This sophisticated yet accessible album raises the bar for band driven singer-songwriter releases in 2016 and it would be a massive injustice if the Canadian awarding organisations don’t come calling when the time arrives to formalise the year. Not a moment is wasted on the neatly rounded ten tracks as the sounds of country, folk and rock are explored within the expansive confines of a mind wandering troubadour. Comparisons with classic and contemporary Canadian singer-songwriters are bound to be forthcoming, but there’s a comparable voice simmering under the surface in the guise of Zac Brown delivering his stripped down material. This jumped straight at me in the exceptional opening track ‘The Ghost of Him’ as Trevor announces his arrival with a confident number while opening his heart in a plea. This song also contains the album’s title buried in the superb lyrics ‘comfort in the shadow, perish in the light'. Following this track would be a tough ask but the next three at least rival it in the quality stakes. The harmonica intro to ‘Long Way Home’ gives it a folk-blues feel which leads into a damn good rockin’ tune topped with one of the album’s many strong chorus parts. If you want the most prominent country focus to the record then the delightful ‘Out of Sight/Out of Mind’ will deliver as the fiddle and steel kicks in on a number that wouldn’t be out of place on a George Strait record. The narrative of loneliness, lifelong reflection and a memory perspective, all fall in line with the lyrical quality that makes country music a marvellous storytelling genre. Track four sees no reduction in quality and impact as the album’s solitary collaboration appears. Fellow Canadian Catherine MacLellan is the ideal choice to sing a duet with and the record’s chief promotional track ‘My Sweet Rosetta’ unfolds as a haunting folk delicacy. Although an original solo write, like the entire album, there is a traditional feel to this song. Violin on this, and several other tracks, comes courtesy of Miranda Mulholland and this rolls out as the instrument highlight alongside Bob Egan’s pedal steel and the variety of keys from Jesse O’Brien. The detected sound of the latter’s organ adds a soulful tinge to the ballad ‘Wasted Ways’, a song guilty for the album’s standout line ‘and the whiskey is just not doing what it has been told’. Serious song writing is maintained in the determined waltz-like message number ‘I’ll Be Who I Am’ and further immensely catchy chorus’ can be found in the alt-country style rocker ‘You Don’t Write Anymore’ and the fiddle led regret piece ‘Wasting My Time With You’. A fairly low key but far from undistinguished closer exists in ‘If I'd Stayed in School’, perhaps slightly overshadowed by its big hitting predecessors. The remaining track sits neatly in the album’s heart and the full band impact exists in the toe tapping rockin’ roller ‘Flash Flood’. The tempo of this tune reflects the record’s undulating sound, demonstrating its architect as the master of a range of differently paced songs. From the listener’s perspective, PERISH IN THIS LIGHT comes across as a therapeutic release with its slick makeover capable of turning many heads. Nights might be drawing in, but Trevor Alguire has a definite spring in his step. This articulate songwriter might be a dream chaser, poetic pursuer and playing life’s chance game with his work, but his message is clearly understood and he is proudly in the possession of an album that is equipped to move his career forward.